I love kitchen gadgets. The right ones can make cooking so much more fun, and efficient! Whether it is a great knife or some obscure tool that only serves one purpose, like a carrot sharpener, they all have a place in my heart (& in my kitchen drawer). 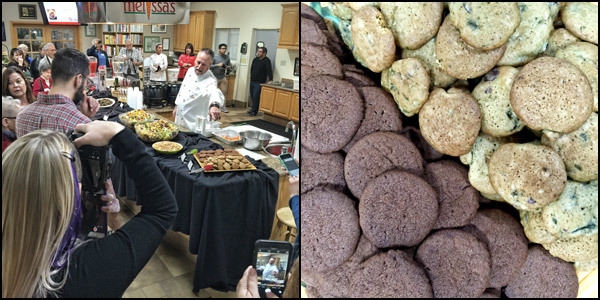 I recently had the pleasure of attending a demonstration of popular culinary tools from Chefs Toys at Melissa’s Produce in Vernon, CA. I knew that I was entering dangerous territory, as my kitchen drawers are already full of other “must-have” gadgets, but I braved the event anyway. 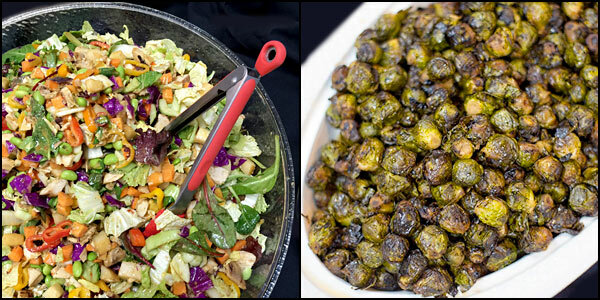 We also enjoyed a Crunchy Asian Vegetable Salad, Honey Sriracha Roasted Brussels Sprouts and two soups: Cauliflower & Celery Root and Black-eyed Pea Stew. After lunch we had time to photograph the food and tools. Nancy from A Communal Table joining in the photo fun. Food bloggers love any excuse to pull out our phones and take pictures! Now, on to the main event and demonstration. Mike Krepistman, on the left, the owner/founder of Chefs Toys, shared with us a about his company’s history, then talked about the future, and culinary trends in the industry. Chef Doug Schonfeld, on the right, is the Executive Chef and Sales Manager at Chefs Toys. 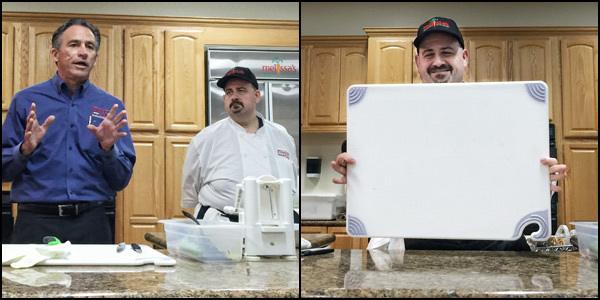 He’s showing us a Saf-T-Grip White Cutting Board, a fantastic invention because of its anti-slip grip corners. (I love it because it’s dishwasher safe, too). Chef’s Toys it is the leading restaurant equipment and supply company that is open to the public here in So. California. They have six superstores located in Van Nuys, West Los Angeles, Fountain Valley, Torrance, Anaheim and Corona. If you don’t live in the area, you can check them out at ChefsToys.com. 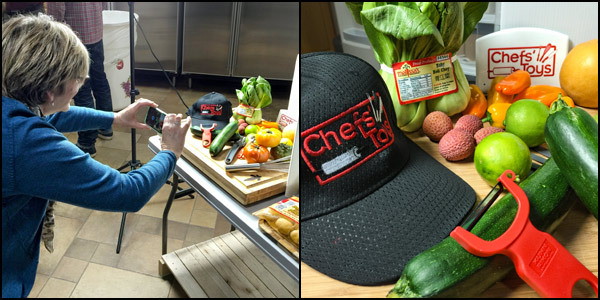 Here is a video with Chef Doug doing a demo on a few of the tools. If you are interested in any of these tools in the video, here are the links where you can find them. The day after the demo, I went to the Chef’s Toy store in Van Nuys. 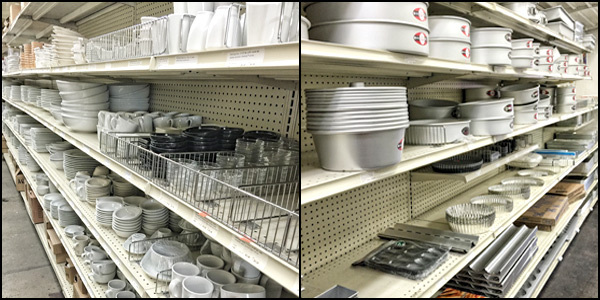 I was lost in a sea of items that would fulfill my every culinary whim. An hour and $100 later, I walked out with so many useful tools that I’m going to soon turn into a gadget-wielding cooking wizard! My favorite purchase was the Adjust-A-Cup Wonder Cup, an adjustable measuring cup that slides up and down to easily remove ingredients. Just slide the bottom to desired measurement. Then fill, and slide ingredients out—no mess! 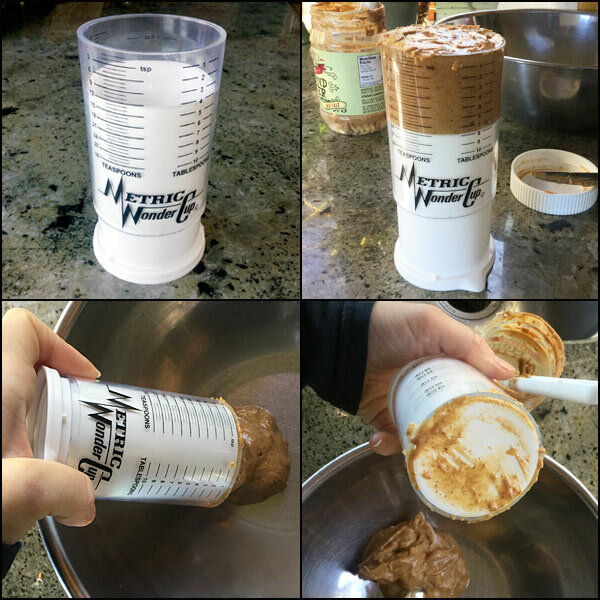 It works with dry and liquid ingredients, but I find it most helpful for sticky ingredients like peanut butter & honey. I love all the other gadgets I bought as well, but will have to share them in another post. I had to sneak my treasures into our house, as my husband would not be impressed with my new space stealers. Fortunately, he doesn’t read my blog. Whew. 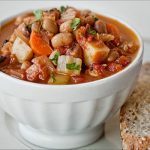 This hearty vegetarian soup comes together easily and full of vegetables. 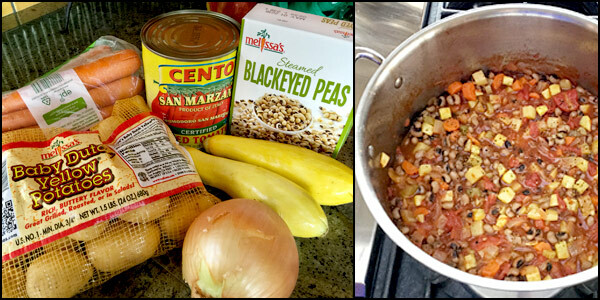 I adapted Chef Tom’s recipe to make this vegetarian & dairy-free. Having a vegetable chopper is what makes cutting the vegetables a snap. Chefs Toys carries a stainless steel Easy Chopper with exchangeable blades. Or you can use an onion chopper as well. In a large pot over a high flame, heat the oil and caramelize the onion. Add the garlic and cook until aromatic, about 30 seconds. Next add the carrots & celery and cook until tender and slightly caramelized. Add the tomatoes to the pot, breaking them up with your fingers and add the sherry. Bring to a boil and then simmer until somewhat reduced and thickened. Next add the potatoes. You will probably need to add some broth to thin the stew. Cook until the potatoes are tender, then add the blackeyed peas and the remaining ingredients (except the butter) and cook until heated thoroughly. Adjust the seasoning and add a bit more broth if the stew is too thick. I am all about good quality knives and gaining the skill to use them, but sometimes a gadget that does it perfectly for me is what I really want. Thank you, Chef’s Toys! This recipe sounds perfect for the cool nights LA has been having. Plus the bonus video on fun tools. Thanks. Great post, Cathy! The stew looks delicious. I can’t wait to visit Chef’s Toys – I actually have one of the Wondercup measuring cups…it is one of my favorite toys! I got it years and years ago and have always wondered who carries them – it’s good to have an extra one of these onhand – now I know! Thanks Sue. I am so infatuated with the wondercup! I guess I am a little late to the party. LOL. I think they make a great gift for the cooks. I just got a julienne/ regular peeler at the FitExpo over the weekend. The sides have garnish tools on it. I couldn’t resist! Rona you are going to love it. I can’t wait to see what you create next. Perfect dish for a chilly day! Mmmmmmmmm. Thanks Nan! It is my new comfort dish. I’ve never been to Chef’s Toys, which is probably a good thing with how packed my kitchen is! Oh my! And that stew! How perfect for this time of year, and healthy, too! I love legumes of most any kind (can you believe it?) 😉 Lovely dish, Cathy and perfect for almost anyone’s diet! LOL Christina. Your drawers can always handle one more tool as I have discovered. Great post and such fun gadgets! So, honey doesn’t leak down the sides of the Wonder Cup? what a great tool! And this recipes sounds yummy. Thanks, Cathy. Susan believe it or not, liquids don’t leak. It is the craziest thing. And it completely pulls apart which makes it easy to clean. Oh Greg you would love this board because you can use both sides and no slip! Brilliant. 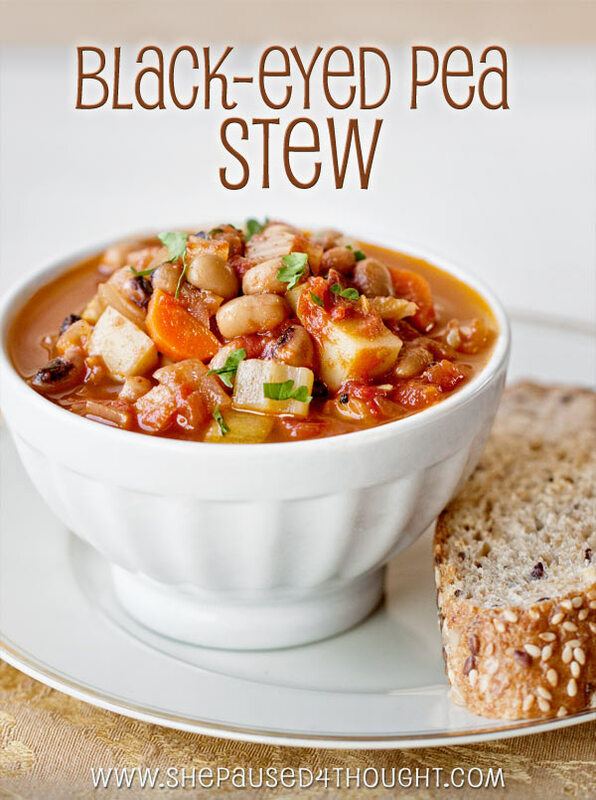 This stew is my kinda one-pot party! Looks fab! Thanks, Adair I think you would love this. As I was reading through your list of tools, when I got to “carrot sharpener” I had to laugh out loud. What…there really is such a thing? And then I thought, I think I really could use one of those. Obviously, I am the biggest sucker for kitchen tools ever. And there is a Chefs’ Toys right near me in Torrance…. No wonder why I like you so much! We must discuss tools sometime. Enjoy Chefs Toys, it is such a fun place.